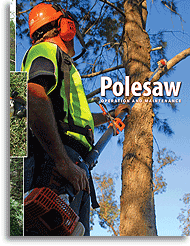 This booklet describes how to use the various types of pole saws available. How to transport and store, operate and maintain. Emphasis is given to fitting, tensioning and sharpening the chain. The book describes the safe operation of the machine and the recommended PPE.